(c) the sodium transporter exchanges one hydrogen ion for each sodium ion, in peritubular capillaries. (d) excreted plasma proteins are acidic. (a) Increase in aldosterone levels. (b) Increase in antidiuretic hormone levels. (c) Decrease in aldosterone levels. (d) Decrease in antidiuretic hormone levels. (d) Descending limb of loop of Henle. 7. Which one of the following options gives the correct categorization of six animals according to the type of nitrogenous waste they give out? (d) posterior pituitary to release vasopressin. (d) Ureotelic mode of excretion. (d) afferent arteriole: carries the blood away from the glomerulus towards renal vein. (d) during summer when body loses lot of water by evaporation, the release of ADH is suppressed. (d) ascending limb of loop of Henle is impermeable to electrolytes. (d) in the liver, but eliminated mostly through kidneys. (d) more sodium in his urine. (d) network of capillaries arising from glomerulus. (d) urea in tadpole and uric acid in adult frog. Angiotensinogen is an a-globulin protein produced by liver. Renin serves as an enzyme in the conversion of the plasma protein angiotensinogen into angiotensin. This protein stimulates the adrenal cortex to produce aldosterone which acts on the cells of the ascending limb of the loop of Henle, and increases the rate of reabsorption of Naf Reabsorption of Na+ brings about the uptake of an osmotically equivalent amount of water. Absorption of sodium and water increases blood volume and pressure. About 65% of the glomerular filtrate is normally reabsorbed in proximal convoluted tubule before reaching the loop of Henle. It absorbs glucose, amino acids, vitamins, hormones, Na, K, Cl, phosphates, bicarbonates, water and urea etc. If it is removed, then more concentrated urine with high osmolarity will be produced. Aldosterone is a hormone secreted by the outer layer of the adrenal gland (cortex part). Decreased blood volume and interstitial fluid level, resulting in decreased blood pressure, trigger aldosterone secretion. When aldosterone is present in the blood, reabsorption of Na+ in the filtrate is increased by the epithelial cells of the collecting duct. Retaining Na–, raises the osmotic pressure of the blood and reduces water loss from the body. When aldosterone is absent, some Na- remains in the filtrate and is excreted with the urine. In salamander, kidneys (mesonepheric) are the excretory organs and the excretory matter is urea. In Labeo, mesonephric kidney is the excretory organ and excretion is ammonotelic. Peacock has metanephric kidneys with excretory matter being uric acid. In housefly, excretion takes place by Malpighian tubules. Excretory waste is uric acid chiefly. During glomerular filtration in kidneys, ultrafiltration of blood occurs i.e., almost all the constituents of plasma except proteins pass onto the Bowman’s capsule. Then nearly 99% of the filtrate is reabsorbed by renal tubules. Proximal convoluted tubules shows maximum reabsorption and nearly all the essential nutrients and 70-80% of electrolytes and water are reabsorbed by this segment. The amount of the filtrate formed by the kidneys per minute is called glomerular filtration rate (GFR). GFR in a healthy individual is approximately 125 ml/ minute, i.e., 180 litres per day. The kidneys have built-in mechanisms for the regulation of glomerular filtration rate. One such efficient mechanism is carried out by juxtaglomerular apparatus (JGA). JGA is a special sensitive region formed by cellular modifications in the distal convoluted tubule and the afferent arteriole at the location of their contact. A fall in GFR can activate the JG cells to release renin which can stimulate the glomerular blood flow and thereby the GFR come back to normal. Excretion of urea is known as ureotelism and the animals which excrete urea are called ureotelic. 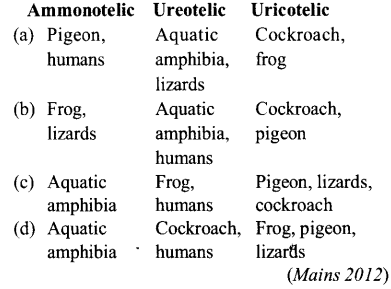 Ureotelic animals include Ascaris, earthworm (both are ammonotelic and ureotelic), cartilaginous fishes like sharks and sting rays, semi-aquatic amphibians such as frogs and toads, aquatic or semi- aquatic reptiles like turtles, terrapins and alligators, and man and all other mammals. Urea is less toxic and less soluble in water than ammonia. Hence, it can stay for some time in the body. Amphibian tadpole (e.g., tadpole of frog) excrete ammonia but after metamorphosis frog excretes urea. The medulla of kidney is divided into a number of conical areas, the medulla pyramids or renal pyramids. Peritubular capillaries, loop ofHenle and collecting ducts lie in the medulla (renal pyramids) while convoluted tubules lie in the cortex of kidney. The visceral layer of Bowman’s capsule surrounds the glomerulus and is composed of special type of cells, the podocytes. The podocytes are so called because they possess foot like processes (projection), the pedicels. The space between pedicels are called slit pores (= filtration slits) through which the glomerular filtrate filters. Antidiuretic hormone (ADH) or Vasopressin increases the reabsorption of water in the distal convoluted tubule, collecting tubules and collecting ducts of the nephrons of the kidneys. As a result, the reabsorption of water from the glomerular filtrate is increased. When someone drinks lot of water, requirement of absorption of water decreases, so ADH release is suppressed. Urine formation involves three main processes namely, glomerular filtration, reabsorption and secretion, that takes place in different parts of the nephron. A comparison of the volume of the fdtrate formed per day (180 litres per day) with that of the urine released (1.5 litres), suggest that nearly 99 percent of the filtrate is reabsorbed by the renal tubules. The descending limb of loop of Henle is permeable to water but almost impermeable to electrolytes. The ascending limb is impermeable to water but allows transport of electrolytes actively or passively. Conditional reabsorption ofNa+ and water takes place in distal convoluted tubule. It is also capable of reabsorption of HCO3. The principle nitrogenous excretory compound in humans is urea. Urea is produced in a series of reactions (urea cycle) which take place in the mitochondrial matrix and cytosol of liver cells. 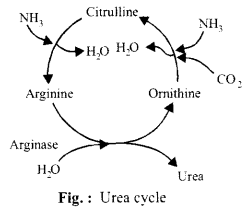 Urea cycle (ornithine cycle) is the series of biochemical reactions that converts ammonia, which is highly toxic, and carbon dioxide to the much less toxic urea during the excretion of metabolic nitrogen derived from the deamination of excess amino acids. The urea is ultimately excreted in solution in urine. Sensory stretch receptors are responsible for the stretch reflex. If these are removed then autonomic nervous system control will not be there and micturition will continue. Micturition is the expulsion of urine from the urinary bladder. Cockroach shows uricotelism. Excretion of uric acid is known as uricotelism and the animals which excrete uric acid are called uricotelic. Animals which live in dry conditions have to conserve water in their bodies. Therefore, they synthesize crystals of uric acid from ammonia. Uric acid crystals are non-toxic and almost insoluble in water. Hence, these can be retained in the body for a considerable time. Uricotelic animals include most insects, (e.g., cockroach), land reptiles (e.g., lizards and snakes) and birds. A person who is on a long hunger strike and is surviving only on water, will have less urea in his urine. Urea, also called carbamide, is an organic chemical compound which essentially is the waste produced when the body metabolizes protein. Manufactured in the liver, by broken down protein or amino acids, and ammonia, the kidneys transfer urea from the blood to the urine. The average person excretes about 30 grams of urea a day. During total starvation with no food being eaten, the body must rely on its own tissues to provide the essential mixture of fuels to sustain life. The primary fuel is stored fat but we also need a continuous supply of glucose. The body has a very small store of glycogen that can provide glucose for about 36 hours, then the body must make its glucose. The body has three sources of glucose, one is the diet (but the person is starving), a second is glycogen (but this is all gone) and the third is a process called gluconeogenesis where the body makes glucose from amino acids. During starvation, the body must rely on body proteins for the amino acids. On high-protein diets the carbon skeletons of the amino acids are oxidized for energy or stored as fat and glycogen, but the amino nitrogen must be excreted. To facilitate this process, enzymes of the urea cycle are controlled at the gene level. When dietary proteins increase significantly, enzyme concentrations rise. On return to a balanced diet, enzyme levels decline. Under conditions of starvation, enzyme levels rise as proteins are degraded and amino acid carbon skeletons are used to provide energy, thus increasing the quantity of nitrogen that must be excreted in the form of urea. Angiotensinogen is an a-globulin protein produced by liver. Renin serves as an enzyme in the conversion of the plasma protein angiotensinogen into angiotensin. This protein stimulates the adrenal cortex to produce aldosterone which acts on the cells of the ascending limb of the loop of Henle, and increases the rate of reabsorption of Na–. Reabsorption of Na+ brings about the uptake of an osmotically equivalent amount of water. Absorption of sodium and water increases blood volume and pressure. Walls of glomerular capillaries and Bowman’s capsule are very thin and are semipermeable due to the presence of pores in the former and slit-pores in the latter. They allow water and small molecules in the blood to pass through them. Fluid containing these materials is forced out of the glomerular capillaries into the Bowman’s capsule by the high pressure of the blood in the glomerular capillaries. This pressure is about 70 mm. Hg in man. The fluid tends to move in the reverse direction due to (i) the osmotic pressure of plasma proteins in the glomerular capillaries, and (ii) hydrostatic pressure of the fluid in the urinary tubule. These pressures in man are about 30 mm. Hg. and 20 mm. Hg. respectively. The net force moving the fluid from the glomerular capillaries, called the filtration pressure, is 70-(30+ 20) or 20 mm. Hg. Under fasting conditions which are associated with high rate of fatty acid oxidation, the liver produces large amount of ketone bodies viz. – acetoacetate, (3-hydroxybutyrate and acetone. The normal level of ketone blood level is 0.2 mmol/L. Presence of excess ketone bodies in urine is termed ketonuria. Reabsorption is a process by which useful constituents of glomerular filtrate are returned into the blood streams. It occurs in convoluted tubules (proximal convoluted tubule) as well as loop of Henle. Basically loop of Henle, in association with vasa rectae, plays an important role in the counter current mechanism (the process which makes urine hypertonic, i.e., more concentrated). Therefore if Henle’s loop was absent from mammalian nephron the urine will be more dilute. Concentration of urine depends upon the length of Henle’s loop. Loop of Henle is the hairpin shaped section of a kidney tubule situated between the proximal and distal tubules in the nephron. It consists of a thin descending limb which is permeable to water and a thick ascending limb which is impermeable to water complex movements of ions and water across the walls of the loop enable it to function as a countercurrent multiplier, resulting in the production of concentrated urine in the collecting duct. Anuria is the complete suppression of urine formation by the kidney. In this case most of the nephrons are destroyed. Uremia is the presence of an excessive amount of urea in the blood. Deamination is the removal of ammonia from amino acids. A nephron is a unit of structure and function in a kidney. A kidney contains about a million nephrons, each approximately 3 cm. long. Bowman’s capsule, proximal convoluted tubule (PCT), loop of Henle, and distal convoluted tubule (DCT). The latter opens into one of the collecting ducts. Nephridia are the excretory organs of annelids. During catabolism, proteins break up into amino acids. The amino acids are converted into keto-acids (such as a- keto-glutaric acid) with the removal of ammonia (deamination). The keto-acid enters the Krebs cycle to yield energy. Carbon dioxide is formed during decarboxylation. Ornithine (amino acid) combines with one molecule of NH3 and CO2 producing citrulline (amino acid) and water. Citrulline combines with another molecule of ammonia and forms arginine (essential amino acid) and water. Arginine is broken into urea and ornithine in the presence of an enzyme arginase and water. Thus the cycle is repeated. This is called urea or ornithine or Krebs- Henseleit cycle after the names of its discoverers. Most of the urea is produced in the liver. The liver cells continuously release urea into the blood and kidneys withdraw it from the blood to excrete it in urine. A cell gains water if it is kept in hypotonic solution or pure water. The phenomenon is called endosmosis. If the red blood cells are placed in a hypotonic solution, one in which the concentration of solutes is less and concentration of water is greater than inside the cells, they will take up water by endosmosis to equalize the water concentration, swell up and may burst. The swelling cells protoplast exerts pressure on the surrounding cell membrane or wall if present. It is called hydrostatic pressure or turgor pressure. Animal cells do not have a wall, therefore high turgor pressure causes their bursting. Individual cells have no role to play in this process. Excess water in the blood affects the osmoreceptors present in hypothalamus and volumereceptors present in left atrium, ventricles and pulmonary veins. This causes ADH release so that body hydration is regulated by removal of excess water by kidney. Glucose is taken back from the glomerular filtrate by the proximal convoluted tubule by active transport. Ammonia is highly soluble in water, so in aquatic animals e.g., tadpole of frog, the nitrogenous waste products are excreted in the form of ammonia. In terrestrial animals e.g., adult frog, these wastes are excreted in the form of urea. The cells lining the proximal convoluted tubule are well adapted for reabsorption of materials from the filtrate. They have abundant mitochondria and bear numerous microvilli on the free side thus giving brush border appearance. The cells reabsorb entire glucose, amino acids, most of the inorganic ions, much of the water as well as some urea from the filtrate. The cells lining the proximal convoluted tubule are well adapted for reabsorption of materials from the filtrate. They have abundant mitochondria and bear numerous microvilli on the free side. Mitochondria power the active transport of nutrient molecules back into the blood. The cells reabsorb entire glucose, amino acids, most of the inorganic ions (Na– k– Cl–) ,much of the water as well as some urea from the filtrate.